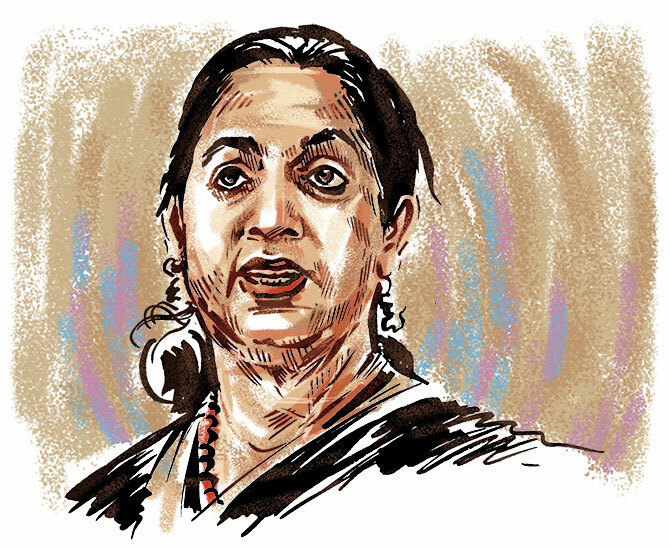 'I feel more like a chess player, thinking for long hours how to make the next move," Telecom Secretary Aruna Sundararajan tells Surajeet Das Gupta. She says her job in the telecom ministry is unconventional -- in fact, she does not feel she is a bureaucrat after all. "I feel more like a chess player, thinking for long hours how to make the next move," she says with a chuckle. That is because, in most other ministries the focus for an IAS officer is making public policy, but in the telecommunications ministry it is more about "commercial arbitration", says Aruna Sundararajan, its soft spoken secretary. I am meeting Sundararajan at The Deck in the India Habitat Centre, New Delhi. She has spent over a year in the hot seat, under scrutiny for every step she takes. "I make it a point to read the leading newspapers every morning because there is always some controversy related to the sector in one of the pages." Her tenure has witnessed a bitter battle between Reliance Jio and incumbent operators on a range of regulatory and policy issues, many of which have landed in the courts. Sundararajan's first choice was the popular Lodi restaurant; unfortunately, it is closed for renovation. So we are at the restaurant that used to be a favourite hunting ground for the calorie conscious. Not anymore. It now serves Italian fare designed by celebrated chef Sabrina Gidda of Bernardi's, London. It is a lazy Saturday afternoon and as we settle down I ask her why she thinks her stint at the telecom ministry is different from her stints at, say, the steel, IT or even the defence ministry. There are few other ministries that touch the lives of a billion-odd Indians, day after day, minute by minute, and can even change lives, Sundararajan says with evident pride. That is what makes it so fascinating. Not that it's all hunky-dory. Many of the problems in the sector have arisen because of the way laws are made, she says. "Given a chance, some of the regulation should be rewritten as they are opaque and full of gaps." For the uninitiated, most of the regulation governing the sector are not laid down by her ministry, but by the Telecom Regulatory Authority of India. That said, the lower rungs of bureaucracy have a lot of power, she says, but in a domain like telecom, which is complex, the need for specialised knowledge is immense. She is in favour of lateral entry -- something the government has just initiated. The table attendant comes with a menu card and we decide to place our order. A vegetarian, Sundararajan wants roasted vegetables with olive bruschetta, a quinoa-based salad accompanied by some hard crust bread and a basil garlic dip. I make a dash for some tiger prawns to start with, followed by a seared fillet of salmon, sauce vierge and spinach. And to wash all of that down, a lemonade. Though not a techie (she has degrees in economics and philosophy), Sundararajan has been in the technology world for many years. As a young officer she pushed the Kerala government to set up an IT department in the state. And in 2003, she kicked off the country's first Internet kiosk project in the backward district of Malappuram, which would become the precursor to the government service centres across the country. She followed it up with a stint in IL&FS, where she was on deputation as CEO overseeing IT projects like the launch of the country's first mobile banking undertaking for truck drivers in Delhi's Kapashera region. As an IAS officer she has worked in two states -- in Tamil Nadu, her original cadre, till she took a transfer to the Kerala cadre to be with her husband who was from that state cadre. Despite being neighbours, the culture of the two states could not be more different, she says. In Tamil Nadu, the structure was imperial and feudal, the DM had to just order and everyone would scramble to do a job. "In Kerala there used to be endless debates and consultations before a decision was made, but developmental debates were so much richer," she says. The reason, she says, must be the long Left movement in the state that brought awareness among people of their rights. She also believes that the Kerala model, wherein 40 per cent of the government funds devolved to the panchayat, is a very effective way of empowerment. She worked on Kudumbashree, a programme that brought women to the decision making table. Our starters arrives and they look impeccable. The prawn is subtle so no complaints. I steer the discussion towards the telecom industry and her priorities, one of which is making India 5G-ready. She laments that Indian industry has not woken up to the paradigm shift this technology can bring with speed that is 100 times more than what we get currently. She says her visit to Barcelona during the GSMA conference was an eye opener -- the 5G technology that was showcased there... take autonomous vehicles for instance... was clearly geared to meet the needs of advanced countries. The challenge is to make that technology inclusive. "The challenge is how do we use 5G to fulfill our developmental objectives in areas like agriculture, health care or smart cities. And how can we become one of the leaders in the development of this core technology," she says. The main course is served and again what stands out is the presentation. The salmon is well done, and Sundararajan seems happy with her quinoa salad. So what are the challenges ahead of the 5G rollout? For one, fiberisation in India is very low. "That has to go up dramatically," she says. Sundararajan is also agitated by the way states look at telecommunication -- as a cash cow rather than an instrument for economic change. "States welcome new infrastructure like a new road or a new airport because they can publicise it. But telecom is an invisible infrastructure, so they say don't put in towers, and impose Rs 20 million for right of way even though fibre goes inside the ground. That's like penalising the telcos. I find that puzzling," she rues. Her targets are ambitious, to say the least. Come September, she promises to start trials of a few pilot projects to showcase 5G applications relevant to India; she has set up test beds (like in IIT Chennai) and is encouraging the big boys in the private sector to help make this vision a reality. I really like the salmon which is smeared with some interesting sauces; Sundararajan orders more bread which she insists is delicious. She wants some chilly sauce because her vegetable dish is too sweet. How come India is still some way from becoming a hub for mobile device manufacturing, I ask. Have we missed the bus already? Sundararajan is not quite as sceptical as I am. "A window of opportunity still exists with global companies still looking at China plus one other country to manufacture devices." But this window might not be there for long -- the impediments in the way of doing business in India, such as delays in land acquisition and getting infrastructure support, must be removed. Skilling of manpower is another area where India needs to focus on. "In short, we must be smarter." The other mistake, she says, has been that big Indian companies that have the muscle to invest and scale up have not been pushed into mobile manufacturing. After a quick scan of the dessert menu, Sundararajan settles for a salted caramel while I go for my all-time favourite, the tiramisu. With such a hectic schedule does Sundararajan get time to do anything else? She admits her reading habit is flagging, but she does pick up an occasional P G Wodehouse when she is stressed out. Shyam Saran for Indian diplomacy and contemporary authors like Pawan Varma are among her other favourites. She firmly believes that women make good administrators. "We don't have time as we have hundreds of things to do, so we have a pragmatic approach -- we just want to resolve a problem and move on." The dessert is too big for her to finish, and as we part ways I wonder what would be Sundararajan's next challenge.